Tools of this sort – called atom interferometers (AIs) – are now used to search for natural resources beneath the Earth’s surface, navigate deep underwater or in the air, and measure Newton’s gravitational constant to extraordinary precision. But the new design, by researchers from the Joint Quantum Institute and its Physics Frontier Center, offers the possibility of unprecedented temporal resolution by harnessing the very recently demonstrated ability to create “synthetic” magnetic fields. We propose a compact atom interferometry scheme for measuring weak, time-dependent accelerations. Our proposal uses an ensemble of dilute trapped bosons with two internal states that couple to a synthetic gauge field with opposite charges. The trapped gauge field couples spin to momentum to allow time dependent accelerations to be continuously imparted on the internal states. We generalize this system to reduce noise and estimate the sensitivity of such a system to be S =∼ 10^− 7 m/s2 Divided by the square root of the frequency. It can detect 100 million less than the earth’s gravity divided by the root of the frequency. This device appears to be about 100 times more sensitive than airborne gravimeters from 1999 discussed in security documents that talked about detecting underground facilities. The 10^-7 m/s^2 sensitivity was achievable for stationary devices. A network of superconducting gravimeters can achieve 10^-8m/s^2 sensitivity. inertial sensors by a factor of one million. Limits of atom gravimeters are discussed here. Even a short interrogation time of 100 ms allows our cold atom gravimeter to reach an excellent short term sensitivity to acceleration of 1.4×10^-8g at 1 s.
The new design takes advantage of yet another quantum phenomenon: “superposition,” a condition in which objects have multiple values of the same property at the same time – the equivalent, in the classical world, of a ball that is simultaneously completely red and completely blue until someone looks at it. Once it is seen (or measured in any other way), however, the superposition disappears and the ball becomes either red or blue. Conventional AIs exploit interference to measure gravity at a given location, typically by directing a stream of atoms into a beamsplitter, which divides the atoms’ wave functions into two branches. Inside the device, each branch is propelled on separate – but completely symmetrical, mirror-image – paths down a cylinder. The only difference between the paths is that one is higher than the other – and therefore responds just slightly differently to the force of gravity. So when the two atom branches are recombined, their matter waves will be out of phase; and the amount of phase difference will be proportional to the difference in gravitational force felt by each. Although useful, that method does not provide a good way to measure how gravitational force changes over small time periods and short length scales. And it necessarily requires the atoms to travel a relatively large distance, typically tens of centimeters, in order to produce a sufficiently large phase difference. The JQI/PFC design, by contrast, uses an atom trap only 50 micrometers in diameter – about half the thickness of a human hair – containing millions of atoms chilled to a fraction of a degree above absolute zero. The atoms sit in a weak, inhomogeneous magnetic field, and each has a slightly different spin state (a kind of angular momentum) depending on its position in the field. 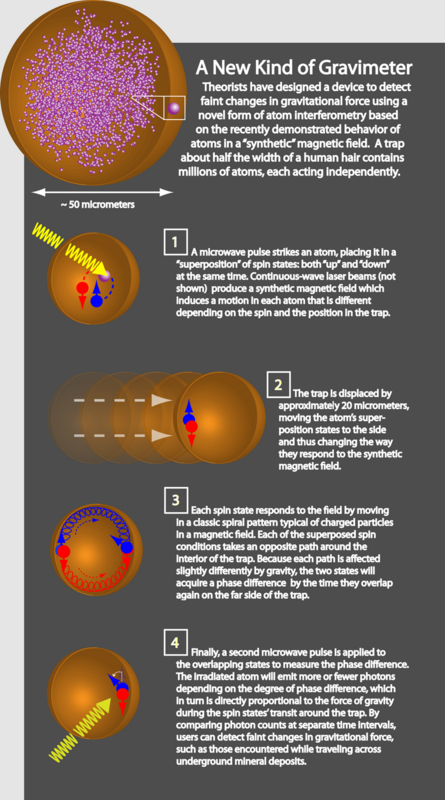 The atoms are irradiated by a continuous-wave laser that imparts momentum to each atom, the magnitude and direction of which depends on the atom’s spin state. This arrangement produces “synthetic” magnetism,** a condition which causes neutral atoms to behave as if they were charged particles in a real magnetic field.